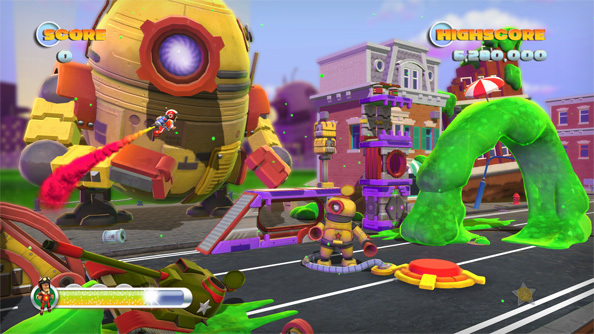 Joe Danger has smashed its way onto PC; read our Joe Danger review. Hello Games is one such studio. They’re cool, they’re indie, they’re laid back, you can walk up to the windows of their office, press your nose against the glass and probably see about seven different secrets before they come out and ask you if you’d like a cup of tea. I went to see them to play the recently announced PC versions of their magnum opi, Joe Danger and Joe Danger 2: The Movie, and to talk to Sean Murray about the studio’s plans. Here’s everything what happened. 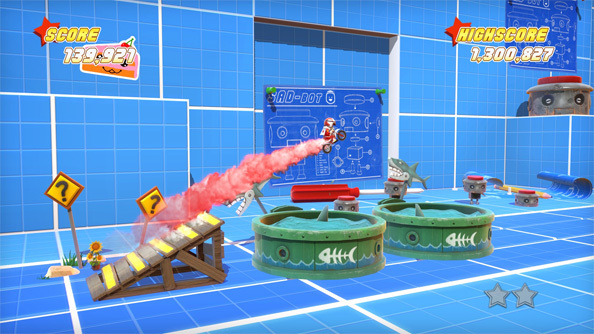 Joe Danger is a retro, arcade-styled, side-scrolling platform racer in which you perform motorbike stunts, accomplish objectives, Evel Knievel it over ramps, collect stars and complete timed challenges. It’s the NES classic Excitebike (and SNES classic Unirally) crossed with a more charming Trials, every bit as challenging and compulsively replayable as the latter and every bit as stylish and classic as the former. Snappy restarts, steadily increasing difficulty and canny checkpointing grab hold of your just-one-more-turn gland and squeeze hard, until your insides are pumped full of filthy I’ll-get-it-this-time adrenaline. Joe first appeared on consoles (and later on telephones) in 2010, and then again in 2012 with Joe Danger 2: The Movie, which cast Joe as meteorically rising stuntman appearing in wonderfully punny tracks based on the classic action movies of Hello Games’ VHS collection. 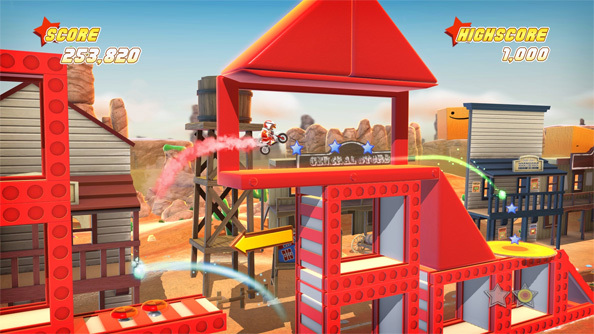 The sequel introduced a glut of improvements, from ghosts and unicycles to more elaborate challenges for veteran players and special ‘outtakes’ tracks, while maintaining the original’s pin-sharp controls, uproariously funny multiplayer (the game sometimes causes literal roaring, often towards the ceiling) and lunch-plans-ruiningly addictive design. Now both games are coming to Steam in a matter of weeks. Exactly when, Hello Games’ Sean Murray isn’t sure, because this is the first time they’ve been able to fully indulge the ‘ready when it’s ready’ mantra of indie PC development, and they’re making sure it’s not just ready, but better in every way. Hello Games could’ve released their Joe Dangers months ago, claims Murray, but they’re overhauling the games for PC, adding Steamworks support, retro-actively feeding Joe Danger 2’s improvements back into Joe Danger 1, making sure it’s compatible with your mouse and adding in more drop down menus. That sort of thing takes time. 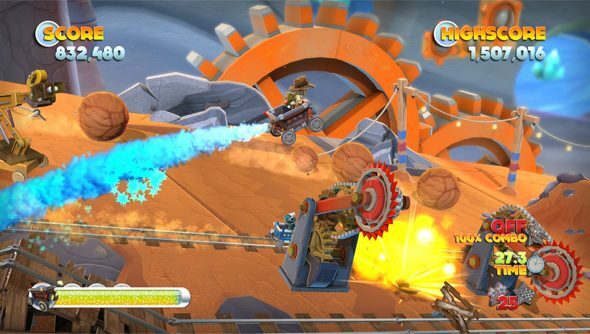 Chief among the changes (the side effect of which is to make these thedefinitive versions of the games, ablurghblurgh PC gaming), is perhaps the seamless integration of both Joe Danger and Joe Danger 2 with Steamworks, a move that allows players to design and share tracks as soon as they’re saved. Tracks are automatically stamped with tags, titles and thumbnails and catapulted across the internet before being rated and curated by other players. And all without having to alt-tab out to an ancillary Steam window. The level designer has naturally been unshackled from the constraints of the control pad, too, allowing for more delicate keyboard and mouse control over the placement of obstacles and pteradactyls. It’s actually an improved version of the tools Hello Games used to create their own levels, Murray informs, prompting grumbles from the team’s level designers who just had to make do until now. “If we were a very commercially driven company we could’ve released this shortly after Joe Danger 2 came out,” admits Murray. “It was what most people would consider finished about four months ago, but we’ve kept working on it because we’re fools. But we’re fools who want to make something good and for the process to be fun. The PC versions retain the originals’ local shared- and split-screen multiplayer modes, just in case your PC is somewhere near a sofa. It also uses its newfound Steamworks powers to spread your ghost data around your friends list like a spectral disease, as well as mock you with the ghost data of the best player on each track, who’ll appear as a glowing orb on screen that, unless you’re all kinds of brilliant, you can never quite catch. Beyond the giant improvements, particularly to the original game, Hello Games are simply focused on creating a very good port, one that shows their beloved hero in the best possible light. “I don’t know about other people,” ponders Murray, “but it kills me when I boot up a port from console and I can’t change settings, I can’t use my mouse in the front end or hit Alt-F4. That stuff means that no matter how nice the game, it’s being served up on a crappy plate. 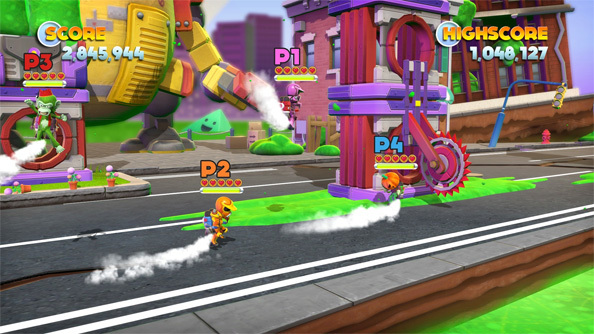 The Hello Games guys roll out their favourite parlour trick to end the demonstration, taking turns attempting to beat the most challenging track in Joe Danger 1 using just a single playthrough. The track is a punishing gauntlet of jump pads, spikes, hurdles, shark pools, hammers and loops, one that they’ve unwittingly, through endless testing and retesting, cauterised into their muscle memory. I could manage about fifteen seconds before being smushing Joe under a comedy mallet. Collectively it takes Hello Games about a dozen attempts to complete it, with each failure drawing supportive yelps from colleagues. This is the game operating at peak difficulty, defying its own cartoonish style to become something impossibly challenging, and three years after the game’s release the team are still visibly passionate about the thing. When that personal expression of silliness and fun includes a fat Elvis on a unicycle punching a monkey, I think that’s pretty much job done.